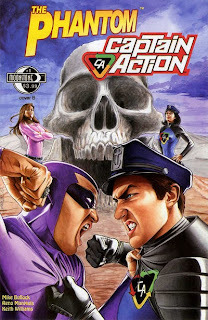 The Phantom and Captain Action (Cole Drake, the son of Miles Drake, the original Captain Action) battle a counter intelligence agency called Tatsu. The Phantom’s wife is called Diana Walker-Palmer in this story, but this must be fictionalization. The 22nd Phantom, who became active in 1989 (as seen in the Marvel Comics series The Phantom: The Ghost Who Walks) was the grandson of the 20th Phantom and Diana Palmer. After his death in 2016, his son took over as the 23rd Phantom. He died in 2024, and his son became the 24th Phantom in 2040, as seen in the animated series Phantom 2040.